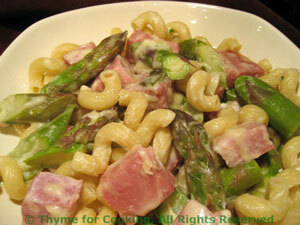 Easy Dinner from Thyme for Cooking: Pasta with Ham and Asparagus. This is a simple, easy pasta dish, served just warm enough to slightly melt the cheese. Get a thick slice of ham and use part in this pasta, the rest in the quiche on Thursday.